Mayon Building up to Explosive Eruption? Mayon Volcano has been undergoing an effusive eruption in recent weeks, with lava flowing down its slopes into the surrounding area since mid-July. Ash columns emerging from the cone have now prompted PHIVOLCS to go to Alert Level 4, meaning an explosive eruption is imminent, and evacuation of the nearby population has begun. News items on the situation from Inquirer, Sun Star, BBC. I really like this photo showing the locals watching lava right where it’s flowing into the danger zone. Trust Pinoys to go rushing to a dangerous lava flow to make usi (rubberneck). 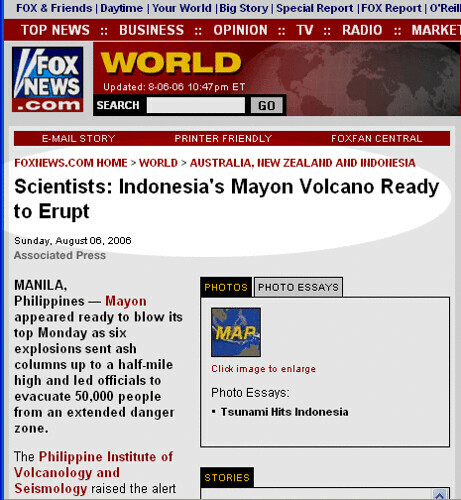 And here’s a lovely news gem from Fox: Mayon Volcano is in Indonesia! Update: After several hours, Fox finally corrected the headline. Our long national nightmare is over.